I'd like to note that the original intent of this plugin was to shore up blueprint support for sessions (mainly steam) until Epic fixed the engine integration for them. Its been over 2 years now with little to no appreciable differences in the core Steam/sessions integration in engine and that leaves this plugin somewhat in limbo. I don't really want to expand the plugin too much as I fully believe that what it does should be part of the engine already and doing so feels like enabling the lax steam/blueprint sessions support in engine. Also most of the major hurdles people run into are locked into the steam subsystem itself and would require basically a re-write of it in order to correct them. I also don't want to drop it because I understand that many users currently rely on it to patch up the missing features and get a game going with blueprints only. I am fully invested in a VR plugin that takes the majority of my free time and feel bad about how I have been keeping this plugin on bugfix mode for this long but feel like that project is the one that I really need to spend my time on. Just thought I would give a heads up, but also mention that the guys working on the UWorks plugin in engine are basically doing the total overhaul approach which is what the engine really needs. And that when they eventually get their subsystem implementation up and running so that it meets the standard workflow for the engine that people should seriously consider the price being worth it. *Edit* this isn't meant to imply that I will not continue to keep the plugin up to date on new engine versions, only that new features are likely to be slow and far between. Plugin now has two modules, one is AdvancedSessions and one is AdvancedSteamSessions, this will allow me to tie more Steam specific functions in without forcing the steam subsystem to be packaged out with projects that don't want it. A Blueprint Library Plugin that exposes additional Networking/Session/OnlineSubsystem/Friends/Voice features to Blueprints that were missing. I took it upon myself to make an all blueprint game just so that I would get a better grasp of the system and not get in the habit of ignoring such a powerful tool. During this mini project I discovered that the Online Subsystem and Sessions interfaces are really lacking with how much of them are currently exposed to Blueprints. Since I had to go in and expose more of the session backend to Blueprints anyway I packaged it as a blueprint library plugin for future projects and thought that I would share it here for anyone else that needed it. I saw a lot of "I want custom server names with blueprints", "How can I get network client player names in blueprints" in the answer hub. I fully expect it to expand significantly as I require new functions for my own use, and I am willing to add to it if anyone has requests as well. 4.13.1 And beyond Sessions have been stable for awhile now, opening up the repository. Added SteamRequestGroupOfficers function to the sessions plugin. Added GetSteamGroups to the sessions plugin. Added GetSteamFriendGamePlayed function to the sessions plugin. Added in some more missing ULocalPlayer header includes to 4.15 and 4.16 versions. Fixed where several variables in the OnPlayerLoginStatusChanged event were set to be inputs instead of outputs. This makes it easier to package without steam included, as the default setup always packaged steam out on PC platforms. Unchecking the AdvancedSteamSessions plugin should allow for totally removing any steam reliance from the plugin. You would also have to remove steam specific nodes from your blueprints as well however as they will no longer exist, just having them as dummies doesn't work with this. You can still package and run on another platform that isn't steam without doing this, this just gives the option of not having steam included in packaging / compilation at all. It is not only not really useful in blueprints, but people have also been using it wrong. total destruction of the session instead by making users call DestroySession as is intended. I feel like that node suffers from overexposing the back end to blueprints. Fixed a bug where the new AllServers secondary search was adding in the first results a second time instead of adding in the second results. Also made the secondary search Steam subsystem exclusive, as it is the only one that uses two seperate server lists. a result as the cost of not downloading the avatar for that user. Made FindSessions AllServers option search twice, once for client servers, once for dedicated, and merge the results. search one first, fill in results, and then search the second and add them in when it is complete instead). Make UniqueNetID from SteamID String - Makes a uniquenetid from a 64bit steam ID string (mostly for testing, can use IDs that are not your friends). Could also be used for storing the string representation of a UniqueNetID and later converting back to retrieve information about them. 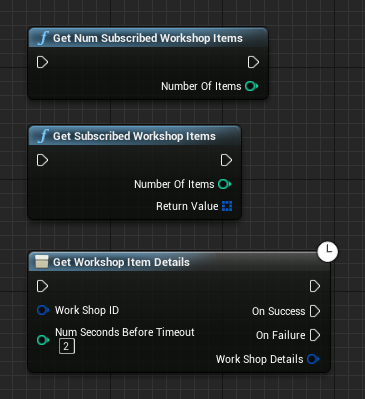 Get Subscribed Workshop Items - Returns how many items and an array of workshop item IDs for workshop item the user is subscribed to. Get Workshop Item Details - Takes a workshop item ID, returns a structure with details about that workshop item. Added execution paths to GetSteamFreindAvatar to make using the node easier. Recompiled 4.14.3 and added 4.15 preview 1 downloads. 01/20/2017- Recompiled and uploaded for 4.14.3 again, might have had a bad upload? 11/20/2016- Recompiled and uploaded for 4.14 release 0 again, might have had a bad upload? 11/04/2016- Fixed a missing assignment in Identity interface, re-uploaded for 4.13 and committed to repository. Now forcing not passing in a player controller if hosting dedicated. This part of the plugin probably won't be of much use to most people, it was a special request. Added additional options to the FindSessionsAdvanced node (All Servers search, full only, empty only, secure only, minimum number of users). Made CreateSessionAdvanced ignore "UsePresence" setting if bIsDedicated is ticked and force presence off (to help avoid misuse). 08/29/2016- Fixed where both friends instance callbacks were the same name in editor, added an MIT license to the plugin so people are free to do what they want. 06/21/2016- Revised how "GetFriendSession" Throws OnSuccess and OnFailure, will now throw failure if the steam call succeeded but returned an invalid session (player is in game but not in a session yet). 06/21/2016- Fixed the GetFriend Node as it wasn't fully filling the Presence information. 05/27/2016- Rebuilt 4.11 adding additional output variables to "GetSessionSettings"
04/19/2016- Rebuilt 4.11 with a fix for searching for dedicated servers and for the 4.11.2 hotfix. 03/31/2016- Recompiled and uploaded a 4.11 download, had to change the ShowWebURL node a bit because of new formatting. In this build and onward it now takes serveral optional parameters. 03/28/2016- Corrected a file inclusion issue with the folder layout so that c++ derived game instances will work again. 03/04/2016- Re-uploaded 4.10.4 with a fix for bIsInSameGame, also added more presence related information and exposed missing ExternalUIInterface functions to BP with the AdvancedExternalUI blueprint node set. As a side note, set the default values for the UpdateSession node to sane numbers. Also exposed the NumPrivateConnections variable to both the create and update session nodes. Last thing to note is that I updated the example blueprint to have all of the missing and new nodes and to fix a few areas that have changed over the versions. 02/24/2016 - Uploaded a new version of 4.10 with some linux specific fixes. 01/20/2016 - Rebuilt 4.10 with an additional node to correct the difficulty of retrieving players UniqueNetIds from the client side (GetUniqueNetIDFromPlayerState) and added some warning comment text to the STEAM specific nodes. 01/16/2016 - Rebuilt 4.10  to the 4.10.2 hotfix, corrected a bug with UniqueNetID::ToString node, and sped up the "GetSteamAvatar" node. 01/11/2016 - Rebuilt 4.10 version with a fix for the Add/Modify session node. 12/21/2015 - Rebuilt 4.10.1 with every setting exposed for the CreateAdvancedSession Node, if you don't know what one does leave it at default for now (anti cheat just flags the server, it doesn't actually enable an anticheat). 12/17/2015- Rebuilt 4.10 to the new 4.10.1 hotfix and fixed some GCC compiler specific issues to hopefully fix the plugin with linux. 11/23/2015- Revised the Update Sessions node once more to pass entire original structure in first before modifying. This should have been how it was written to begin with, oops. 09/14/2015- Updated 4.8 download as it was requested. 09/03/2015- Updated the 4.9 download, this version fixes the UpdateSession BP Node - 4.8 not updated, will be updated if requested only. 08/31/2015- Updated the 4.9 download to a version compiled under full release. 08/27/2015- Updated both 4.8 and 4.9 Plugins, adds several new nodes for sessions and the first release of the Advanced Voice Interface Nodes. 08/18/2015- Re-uploaded the plugin for 4.8 to move the files into a sub folder to fix a packaging error. Last release did not have the files in a sub folder already (whoops) and was causing packaging problems. 07/31/2015 - Re-uploaded the 4.8 build with a revised CreateSession that allows to not pass in a player controller and has the "Dedicated Server" boolean. Not passing in a player controller WILL NOT WORK with client steam builds as it needs the UniqueNetID to create the session. This was added in for dedicated server builds that don't initialize the SteamAPI and don't have a valid player controller UniqueNetID. #TODO in the future would be to also add in a "JoinViaPresence" boolean to control if a session is invite only or not. Would probably add this in if someone requests it. The 4.7 build will stay at the last version as 4.7 was less stable overall and 4.9 will be out soon. 06/26/2015 - Re-uploaded the zips without an extra UAsset file in the examples folder, it was crashing someones editor for some reason and wasn't supposed to be there anyway. 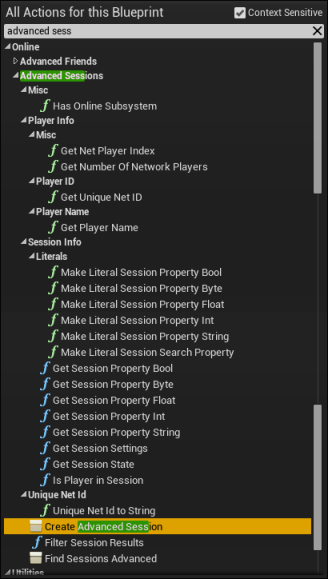 05/28/2015 - Final version of sessions functions (hopefully no more signature changes), added many new friends related functions, added a few new session functions, zip now includes a blueprint with the functions labeled and laid out with use cases in it. As of the 4.22 patch, the steam subsystem has a few useful definitions that you can set in Target.cs for dedicated servers to prevent having to manually edit source files. I have listed them below for convenience sake. These definitions would have to be set in the Target.cs of your project file (IE: a source and not BP project). Please refer to the Steam project documentation regarding setting these flags and their appropriate values. Extract the file inside the zip to ProjectFolder/Plugins/AdvancedSessions (create /Plugins/AdvancedSessions if you have to) Note that post 4.20 you shouldn't be installing it in the engine directory anymore due to some changes epic made that are hard to work around with me having multiple modules. If installed at the project level you need to Create a C++ blank file in the editor to allow it to package out the plugin - If installed at the engine level you do not need to do anything else. *NOTE* If packaging for a platform other than windows you may need to have the plugin installed at the project level, as I can only package out for windows and not Mac / Mobile. Copy the example blueprint file into your content folder if you want to look at the examples. To get the ability to join a session invite when it has been accepted through the online subsystem (IE: Steam freind game invite) you will need to derive your GameInstance from AdvancedFriendsGameInstance so that it will bind the Delegate, you can also use the added event in the graph. This game instance also enables accessing the "PlayerTalkingStateChanged Delegate". *01/14/16* Also added an OnSessionInviteReceived Delegate that triggers if you have been invited to a game, you can accept in game by joining the session it gives you *Not yet implemented by Epic, do not use this event yet!!*. 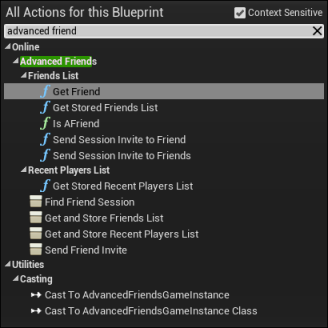 If you want the AcceptedSessionInvite event to be called in the owning player controller you also need to add the AdvancedFriendsInterface to the blueprint for your player controller. 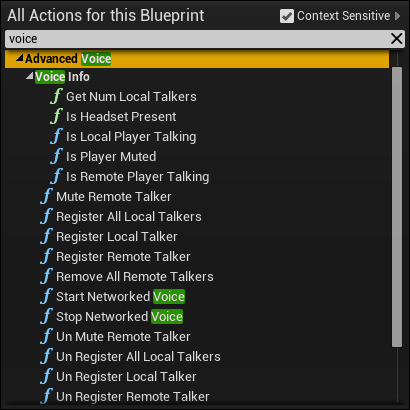 To use Push To Talk, bind a key to "Stop Networked voice / Start networked voice" for a local player. To enable voice in your build copy the following settings (From Epic Answerhub). *Note* If you are updating a session I highly advise that you fill ALL of the Update session parameters with your values as otherwise it chooses default ones that might not work for you. Last edited by mordentral; 04-03-2019, 08:17 AM. This looks pretty incredible! Thanks! Yes! that's exactly how it should have been in the first place that's just perfect thanks a ton man. I'll be definitely using it to add custom search filters (such as game mode, map type etc).. I will let you know if there are any problems, although it's looking perfect so far. Umm.. may I request for the full source code? I have some custom engine build where I might need to use this (also would be great learning source). Last edited by TK-Master; 05-13-2015, 06:37 PM. Wow great work! Since I haven't gotten into c++ yet this looks like it's gonna improve the quality of online play on my project by a lot! I'm gonna check it out, thanks again for doing something like this! Yeah it is a temp solution mostly, I assume that they will fill in this section of blueprints themselves at some point. The real fix would be to expose these same functions directly in engine where they are, however it would be impossible for me to finish my fun all BP game in the meantime with them missing and I noticed that I wasn't the only one looking for an answer. I held off making anything until I got to check out 4.8 and they were still not exposed before I made myself the library. I wouldn't have bothered except I was seeing dozens of BP only devs asking how to do these things through BP. I am not following Epics syntax for blueprints very closely, also I am getting these externally and not directly in the classes that they naturally reside in (so it works as a plugin and not an engine source change). I would have to remake them in their proper locations and change a decent amount of things to get them into a pull request, I am also 100% sure that my key-pair temporary solution isn't set up how they would want to handle it either. They have TPair already and FVariantData that could be set up to be accessible and assignable directly through blueprints without the third party struct. If you have a build of the engine that you are working off of directly then I would suggest that you go into the OnlineSubsystem interface and start adding in blueprint function accessibility directly. Last edited by mordentral; 05-14-2015, 10:14 AM. I have tried before but my C++ knowledge didn't get me very far sadly. I'm using some of the nvidia branches (with VXGI, Flex etc.) so I was hoping I could use the plugin there eventually (since Epic isn't going to add this any time soon, obviously.. sigh) but if you don't want to share source, that's fine I thought I should ask anyway. I can give the source to it, but I was warning you that if you are working off of a source build that there are better ways to do it and that I would avoid replicating the plugin implementation in a source build. but I was warning you that if you are working off of a source build that there are better ways to do it and that I would avoid replicating the plugin implementation in a source build. Yes I see, but the problem is that you need to re-compile the plugin if you are using a custom engine version (which you can't do without the plugin sources currently ), that's the main reason I'm asking. Although it would be a good learning source for me to see your implementation. I'm adding / changing a few things today (got my work done for the week, its UE4 dev day), i'll upload a version with the source afterwards. plugin? I won't add this to the Marketplace, it is just for giving the users an idea where they can expand the system. Yeah that is fine, i'm including the source after this upload anyway and i'm not trying sell it or anything. I would wait until this upload goes live later today though, I re-factored the functions to use that newer Enum Break for Execution pins that Epic added, it makes things way more intuitive to use and cleaner. New version with source is uploaded, using the key/value pairs is a lot cleaner now.